Stay put. Avoid driving, if at all possible. The safest place to be is off the roads. Slow down. When roads are icy, vehicles don’t have the traction required to stop quickly. Stay alert. When the temperature is near freezing, the roadway may look wet when in fact ice is forming. Check tire inflation often. As temperatures drop, so can your tire pressure. Low tire pressure does not give tires better traction in icy conditions, it only makes them more vulnerable to damage. Remember that bridges and overpasses are more prone to freezing in these types of conditions and will ice over first. Proceed with caution when driving in these areas. Don’t attempt to pass slower vehicles. Leave plenty of space between your vehicle and the vehicle in front of you. Gently apply brakes and accelerate at a slow speed. Florida does not allow tire chains. Section 316.299, Florida Statutes, states that only tires with rubber studs designed to improve traction are permitted on public roadways. Be patient and courteous. Driving in adverse weather conditions can be stressful. 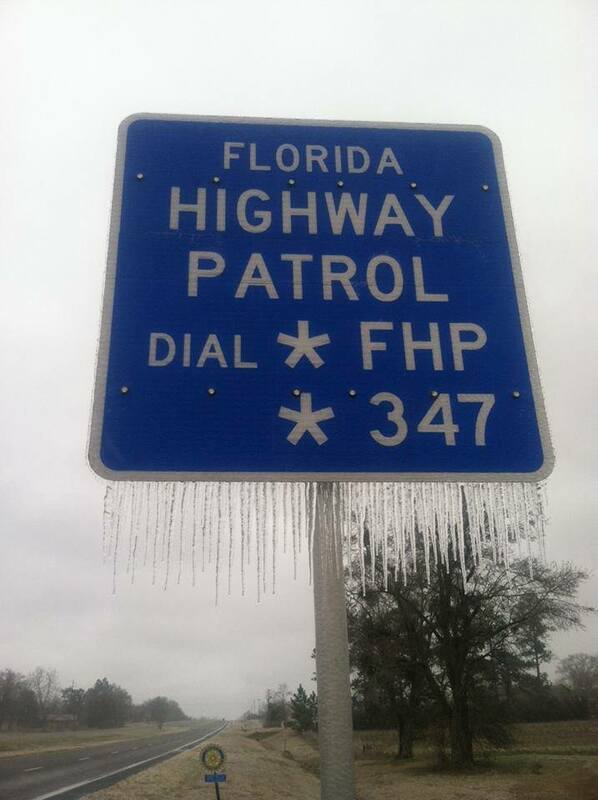 Remember to dial *FHP (*347) from your mobile phone if you are on the road and need assistance.